D’Appolonia provides a complete range of engineering services pertaining to industrial and commercial site development including site exploration, wetlands delineation, development of site conceptual layout plans, grading plan preparation, demolition plan preparation, design of stormwater management components, preparation and implementation of erosion and sedimentation control plans, layout and design of site roadways and parking facilities, site utility design, and permitting for all aspects of site development. We prepare plans and specifications for construction, and we routinely prepare bid packages, solicit and evaluate bids, and provide recommendations relative to contractor selection. We also frequently provide assistance relative to project planning and scheduling and with respect to gaining funding for development activities. We are experienced in working with tight schedules, and we know how to facilitate obtaining regulatory approvals. The first step in evaluating a site for possible development is to conduct an exploration program to identify important site characteristics. These characteristics normally include the ground surface contours, subsurface stratigraphy including the suitability of soils and rock for structural foundations, and the presence of nearby streams (that may flood) or wetlands. A candidate site must also be carefully assessed with respect to the possible presence of contaminants or physical conditions (such as undermining) that may make development unattractive. Other siting factors include access to transportation (streets or rail) and access to critical utilities such as water, electric, telephone, gas, and sewer. Development of a new site generally requires that provisions be made for storm water detention, and this must be accommodated in the site layout and grading. D’Appolonia routinely conducts site exploration studies and we are experienced in evaluating sites with respect to the suitability for accommodating proposed developments. In urban areas many development projects involve the reuse of a former industrial site. These sites often require the partial or total demolition of some structures. D’Appolonia is experienced in the preparation of demolition plans, and we normally provide on-site monitoring of the demolition work. We are experienced in dealing with hazardous materials (such as asbestos) that must be handled in accordance with environmental protocols. We prepare site layouts to accommodate new development and associated grading plans. Our experience with respect to the design of structural foundations, retaining walls and embankment slopes, stormwater retention basins and other site features enables us to develop attractive layouts and efficient grading plans. We frequently work with structural and landscape architects on site development projects. D’Appolonia is experienced in dealing with issues related to management of runoff associated with site development both during and following construction. New developments typically require that stormwater detention be provided, and we are experienced in the design of surface detention ponds that attractively fit into the site layout. We have also designed underground storage facilities where there was no room for a detention pond. We routinely develop erosion and sedimentation control plans for all of our projects involving earthmoving and site grading activities. Many sites are located near streams and potential flooding is a consideration. D’Appolonia is experienced in determining appropriate design-basis flows and in routing them past the site (considering site runoff). 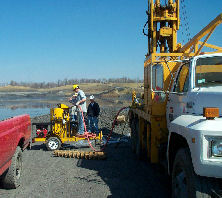 The maximum flood elevations are used to establish elevations of key site structures. A key component of site development involves bringing utilities such as water, electric, telephone, gas, and sewer to site structures and designing site roadways and parking such that access to the transportation infrastructure meets site needs and local regulatory requirements. D’Appolonia has long-term relationships with electrical, mechanical and HVAC subconsultants and we routinely work with them on site development projects. 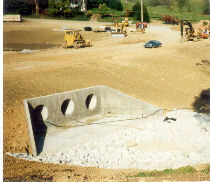 We typically handle site sewer system designs directly and are experienced in their design and permitting. We plan site roadway and parking lot layouts and are experienced in the design of subbases and pavements. We are experienced in working with local governments and utility companies relative to regulations and requirements associated with utility hookups and in linking site roadway entrances to local streets. As a part of determining site feasibility, D’Appolonia is experienced in preparing cost estimates associated with construction of various development schemes, so that alternatives can be compared with respect to both desirability and cost. This experience has been gained through completion and construction of actual engineering designs. We also prepare estimated schedules for projects based upon our experience with construction and the associated regulatory timeframe. We are familiar with all aspects of permitting for development projects, and we routinely interact with regulatory agencies and personnel in obtaining the necessary permits. Occasionally we are called upon to assist in obtaining funding, and we have provided these services for a number of development projects.